So I made these this week actually to eat with my breakfasts. I started a Whole 30 on Saturday (more on that later), so I wanted to add a lean animal protein to my breakfast. Well, here’s a pretty simple way to do it! Be warned, these meatballs are not like, delicious, decadent, moist meatballs of your childhood. They are really basically seasoned meat to accompany your morning eggs. Next week, I may splurge on some all natural, no filler breakfast sausages from whole foods or something, but for this week, it works! Well now that I’ve totally sold you on these…here’s the recipe if you need a little meat for your morning! I make 10 large meatballs so I can grab 2 each morning of the work week, but you can divvy these up any way you’d like. Preheat oven to 350 degrees. Combine all of the ingredients in a bowl (I use my hands – it’s easiest, really). 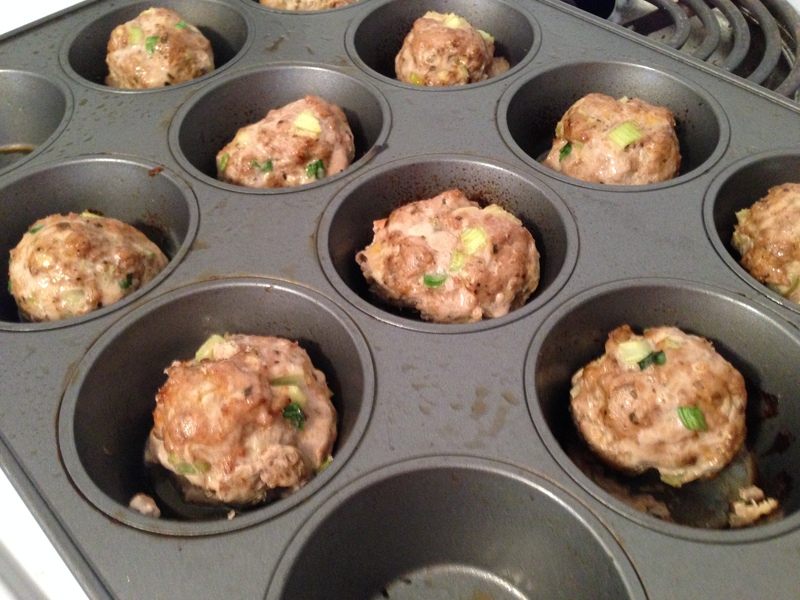 Form into 10 large balls, and place in a muffin tin. Bake for about 30 minutes, or until cooked through. If you make them smaller, reduce cooking time.